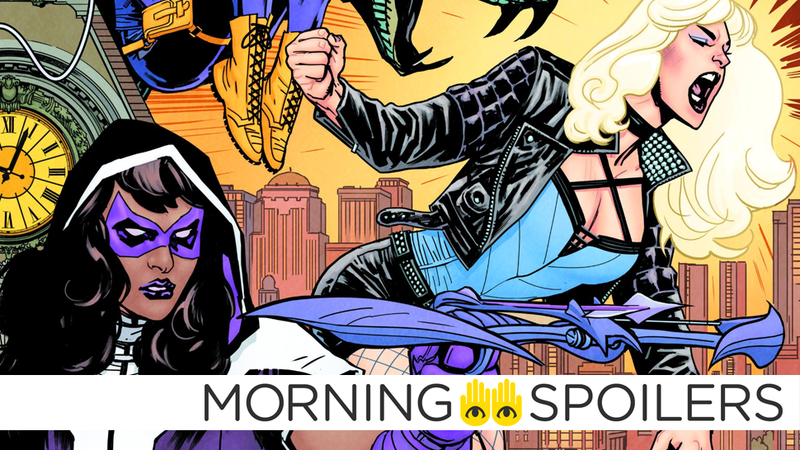 Morning Spoilers: Has Birds of Prey Found Its Villain? The Birds of Prey could be hunting a Batman foe in their movie. There are more rumors about just what the live action Star Wars TV show could be based on. The Meg director Jon Turteltaub talks the grisly deaths that got cut from the film. Story beats first planned for Justice League could live on in the Cyborg movie. Plus, new looks at Predator and Bumblebee. To me, my spoilers! The Wrap reports mob boss and leader of the False Face Society, Roman “Black Mask” Sionis, will appear as the film’s villain. Speaking with Bloody-Disgusting, director Jon Turteltaub revealed several “really horrifying, disgusting and bloody deaths” were cut from the film to secure a PG-13 rating. My wife is glad about it and I’m glad my kids can see the movie, but the number of really horrifying, disgusting and bloody deaths we had lined up that we didn’t get to do is tragic... We shot or even did a lot of visual effects for [gory scenes]… We just realized there’s no way we’re keeping this PG-13 if we show this. It’s too fun a movie to not let people who don’t like blood and people who are under, say, 14 years old into the theater. I was very hesitant to cut out a lot of blood and gore. I wouldn’t have if I thought it was wrecking the story but it wasn’t. In a recent interview with /Film, actor Joe Morton revealed Cyborg’s original story arc in Justice League could still be used for the character’s solo movie. Unfortunately, I can’t tell you what [the original story] is because that might end up being in part of the Cyborg movie. There was a big change once they decided that they were going to do the Cyborg film. Vin Diesel’s adaptation of Valiant Comics’ Bloodshot has officially begun filming. Empire has a new image of Bumblebee attempting to make himself comfortable. The latest TV spot introduces us to the misfit team meant to save humanity from the Predator. Screen Rant has a trailer for The Landing, a faux-documentary exploring what really canceled the Apollo 18 mission. Making Star Wars has an early rumor suggesting that Jon Favreau’s Star Wars TV series could revolve around the Mandalorians, showing how the society glimpsed by fans during both Clone Wars and Rebels deals with the freedom of the Empire’s downfall. CW president Mark Pedowitz confirmed there is (currently) “no plan” for Batman to appear in the upcoming Batwoman TV series. There’s no discussion about a series. Batman already exists in the Arrowverse because last season Oliver Queen mentioned his name at one point. And Batwoman, if the series goes forward, lives in Gotham. There’s no plan at this time to have Batman appear. Speaking at the Television Critics Association on Monday, Showtime President of Programming Gary Levine revealed the Halo TV series will premiere in 2020 and star the video game series’ masked protagonist, the Spartan supersoldier Master Chief. It is a new story, but we are being incredibly respectful of the canon and working with Microsoft 343 people to be sure we don’t violate any of that. We made a conscious decision to hire a writer not known for sci-fi or big battle movies because that’s already baked into the Halo franchise and we will service that but we also wanted to make sure we were getting underneath the armor of the spartans to the human drama, so it felt like it belonged on Showtime. Our hope is it will appeal to Halo fans and Showtime drama fans. Jordan Peele’s latest incarnation of The Twilight Zone enters production “in the next couple of months,” according to Executive Vice President of Original Content at CBS, Julie McNamara. We have a room, we have a first season of concepts, outlines, scripted — various stages of all these things — of that 10 eps a season. We are well on our way, and we are going to start production in the next couple of months. Speaking at the Television Critics Association summer press tour on Monday, Mark Pedowitz confirmed Netflix’s upcoming Sabrina, the Teenage Witch series will not cross over with the CW’s Riverdale. However, Roberto Aguirre-Sacasa “has something in mind” for a potential Riverdale spinoff. Conversely, Pedowitz revealed he doesn’t believe there will ever be a Supernatural spinoff. I am concerned...it may be [stars] Jared [Padalecki] and Jensen [Ackles]. And there may not be a franchise beyond that. If there’s a great idea that [the producers] want to go forward with, we’re open to listening. It is a great franchise. We were very happy with the women who were in the Wayward Sisters spinoff. We had a certain number of slots this year. So it just didn’t get there. Pedowitz also stated he “doubts” season six will be The 100's last. I doubt it actually. Jason Rothenberg did a remarkable job of revitalizing the show, and I hope it can go on for a long time. Meanwhile, CBS All Access president Marc DeBevoise has again confirmed The Stand series is still happening. Filming has wrapped on the series finale of Shadowhunters.